With two 0-4 teams facing off at MetLife Stadium, something had to give. The stadium notably lacked life, as it rained all morning prior to kickoff, creating an eerie, something-just-isn’t-quite-right-type feeling. Just 3 and a half hours later, that eeriness was proven right. The 2017 season couldn’t have gotten off to a worse start leading up to this match-up, or so we thought. This 2017 Giants squad was about to find themselves on the wrong side of team history. The defense was stout early, not allowing a first down over the course of their opponent’s first three drives. With Kerry Wynn on the field in place of the injured Olivier Vernon and Ross Cockrell seemingly having passed Eli Apple on the CB depth chart, there was a sense of new energy and confidence. On the second possession, LA quarterback Philip Rivers did not see the shotgun snap coming from deep in their own territory. With the fear of oncoming defenders potentially landing on the ball for a defensive touchdown, he smacked the ball out of bounds for a safety. The Giants offense paired this hot start with something we haven’t seen yet, a consistently-productive running game. Orleans Darkwa got the start in the backfield and they rode his hot hand all the way into the end zone, as he carried the ball 6 times for 58 yards in the first quarter, the final carry being a 23-yard touchdown. The line, particularly inside, was dominant at the point-of-attack and things were looking up as the Giants took their 9-0 lead into the 2nd quarter. On the Chargers’ fourth drive of the game, they began to move the ball via a balanced run/pass attack. Their star running back, third-year Melvin Gordon, hadn’t been seeing success as much as last season to this point. They were noticeably trying to force-feed him the ball via the ground and air, as he got the ball 4-out-of-8 plays including the one that got him them into the end zone on a 6-yard catch after he easily beat B.J. Goodson in coverage. Speaking of Goodson, he was exploited as a pass defender on a couple of occasions on this drive and his 15-yard unsportsmanlike penalty for physically contacting a ref was a huge, costly mistake. With the Giants lead cut down to 2, rookie Wayne Gallman was the feature player on the next drive. He was consistently making the first man miss, getting the Giants near midfield but in typical 2017 NYG fashion, the offensive line was completely blown up on a 3rd-and-1 attempt, ending in a 2-yard loss, forcing NYG to punt. The Giants defense got back on track, forcing three straight 3-and-outs. The combination of poor field position, dropped passes, and a dominant Damon Harrison continued to shut down this Chargers’ offense. They converted just 1-of-7 third downs, a theme that would not exactly stick for the rest of the game. The Giants’ offense had their best opportunity of the day to create distance on the scoreboard just past the halfway point of the 2nd quarter. 1st-and-10 at the Chargers 39-yard line. A bad drop by Darkwa, an overthrow by Manning to Engram down the sideline, and a false start by tackle Bobby Hart pushed them out of field goal range and into a punt situation. Valuable points were left on the board via shooting themselves in the foot. To finish off the first half, LAC put together the first of their three 11+ play drives. They drove all the way down to the Giants’ 6-yard line but thanks to one of Keenan Allen’s three drops on the day, they settled for a field goal as the time ran out. LAC headed in to the locker room up 10-9 despite being outplayed by the Giants the entire half. The start of the second half was an interesting case of back and forth as both teams had the momentum in their laps, but failed to seize the opportunity to fully secure and run away with it. After going 3-and-out, the Giants punted the ball to LAC. Speedster Travis Benjamin keyed a 19-yard return giving the Chargers 1st down at midfield. At the snap of a finger, they were inside the Giants 10-yard line looking to lengthen their lead. Darian Thompson, whom played the best game of his young career by a wide margin, intercepted a 3rd down pass intended for Allen. He went down in the end zone, securing the touchback and gave Eli Manning the opportunity to shift the lead again. The Manning-to-Beckham connection finally woke up, connecting twice for 31 yards. On 3rd-and-5 from the LAC 29-yard line, Manning overcame his deep ball accuracy issues from the first half and dropped the ball in a bucket to Roger Lewis for a touchdown. It was as good of a pass as anyone could have thrown in that situation and Lewis did a fine job of tight-roping the sideline and holding onto the ball as he crashed to the ground. The Giants took 16-10 lead and against an 0-4 team, this was supposed to be the stopping point. The Chargers pieced together another 12-play drive, their second in three possessions. Towards the start of this possession, however, the refs overlooked a major penalty that could have easily altered the outcome of this game. On 2nd-and-9 from the LAC 9-yard line, Rivers was pressured and as he began to vacate the pocket, he threw the ball away where there was no Chargers’ receiver. He made the throw from his own end zone, thus it should have been a safety, as intentional grounding was never called. The refs claimed he made it out of the pocket, but that was not the case. What should have been 2 points and possession to the Giants turned into an eventual touchdown. Rivers completed three passes on 3rd down this drive, one of which was 3rd-and-15 and the last being a 18-yard gain the play before their touchdown to tight end Hunter Henry, whom beat Collins for the ball. Down 17-16, Manning responded by inching his way up to midfield before pump faking a short slant to Beckham, whom got an easy and free release to his deep route and ended up with no one around him as he jogged into the end zone with what ultimately ended up being his last touchdown of the season. The Giants, with what has now become too much the norm, failed to manage the clock properly as they lined up for a 2-point conversion attempt. They were bumped back a crucial 5 yards and weren’t even close to securing the 7-point lead. New York led 22-17. After trading back and forth possessions, the Chargers added 3 more points at the end of an 11 play drive. On the next drive, the Giants almost-hopeless season turned, well, hopeless. Beckham was badly injured and carted off, making him the fourth receiver of the day to leave the game with an ankle/foot injury. The pass catchers were decimated from a personnel standpoint, the Chargers offense was showing they could drive the ball down the field without much of a problem, and the Giants lead was only at 2. On the next play, Manning was sacked by, you guessed it, another stunt play by the Chargers defense and ended up losing the ball via fumble. LAC recovered and it took them just 3 plays to score on a Rivers pass to Gordon. The score was 27-22 just like that and NYG had little to no hope of moving the ball with their injuries and shaky offensive line play. The Giants were able to muster together two first downs and got over in to LAC territory, for a short time. Bobby Hart, who had a game to forget, was flagged for illegal hands to the face and instead of it being 2nd-and-2 on the LAC 40-yard line, it was 1st-and-20 from the Giants’ 42-yard line with 1:20 left on the clock. Four plays later, Manning was intercepted by safety Tre Boston and that signaled the end. The Giants lose, 27-22, and fall to 0-5. Eli Manning: 21/36 – 225 yards – 2 TD/1 INT – 83.7 rating. As we’ve seen the previous two weeks, Manning showed up in the second half. He was spreading the ball around, getting it out quick, and was responding to pick up the Giants shaky defensive play. He did struggle mightily in the first half, especially with the deep ball. He had two plays where Beckham was open downfield for a touchdown, but overthrew him by 5+ yards. He was sacked 5 times and lost a fumble. Orleans Darkwa: 8 att – 69 yards – 1 TD. After missing a game with injury, Darkwa came back as the starting running back and gave the Giants their best performance out of the backfield this season. He showed off his aggressive downhill style that initially drew everyone to him early in his career. His 23-yard touchdown run saw a combination of good blocking and late movement to miss tacklers. The one glaring issue here, however, was his 3 drops. Not good. Wayne Gallman: 11 att – 57 yards – 5 rec – 27 yards. Another impressive game for the 4th-round rookie who ran with such an elusive style. Gallman, on multiple occasions, showed the ability to create something out of nothing. Intended running lanes aren’t always there and with the good backs, that doesn’t always matter. Gallman is showing a trait that can be very hard to find. Shane Vereen: 5 att – 18 yards – 4 rec – 27 yards. His biggest play of the game was called back by a Roger Lewis hold. His one-handed grab and 20-yard scamper was a thing of beauty. That play is what I think NYG could have and should have been using in recent weeks more often. He is such a weapon in the screen game with his awareness of defenders and blockers in space. Odell Beckham: 5 rec – 97 yards – 1 TD. The last game we will see Beckham play in 2017 was a solid one. He was quiet early but if it weren’t for a few overthrows by Manning, we could be talking about a breakout performance and NYG win. Who knows, maybe even a healthy Beckham. 2017 couldn’t have gone worse for the kid who wants to be the highest-paid player in the NFL. These next 6-9 months of rehab will tell us a lot about him and his future with the team. Mouth shut, get to work. You have a ways to go. Brandon Marshall: 2 rec – 15 yards. Speaking of individual situations that couldn’t have gone worse this year, Marshall’s 2017 is now over as well. An ankle injury that required surgery will sideline him the rest of the year. Marshall didn’t impact the game, or the season, much. It wouldn’t surprise me to see him hang up the cleats for good in the coming months. Sterling Shepard: 1 rec – 9 yards. On a day where 4 of the top 5 NYG receivers went down, Shepard was the day’s first. He was hurt in the 2nd quarter and he too, won’t be back for awhile. If the season continues to go down the path it is currently headed, the team may very well opt to keep him out until 2018. Roger Lewis: 1 rec – 29 yards – 1 TD. Eli Manning deserves a ton of credit for the touchdown pass to Lewis, perfectly dropped in the bucket where only he could grab it. However Lewis showed tremendous ball skills by getting both feet down in a tight space and holding onto the ball after hitting the ground hard. There is a draw to this kid’s talent, one of the top UDFA’s from the 2016 Draft Class who would have been a mid-rounder had he not had some previous off-field issues. This is his opportunity. Lewis is now the team’s number one wide receiver. Rhett Ellison: 1 rec – 9 yards. Ellison played a season high 71% of the team’s snaps, partially due to the multiple injuries at wide receiver. I’ve been banging on the table since week 1 in Dallas that this guy needs more playing time. He needs more looks in the passing game. Well, by default that is about to happen. Evan Engram: 0 rec – 0 yards. For the first time in his young career, Engram was shut out. His opportunities were almost zero, as well. He was thrown to 4 times but on none of them did he really have a credible chance at bringing in. He is going to be the feature part of this offense now and I’m not sure if that is a positive or not. I assume they are going to split him out wide most of the time, but there he may be matched up against the opposing top CB. That’s what I would do if I was against the Giants. Will he be able to separate? Or is he a guy who needs the outside receivers to take pressure off him? A positive note: Engram has graded out positive as a blocker in all 5 games this year. Tackles: Ereck Flowers had his best game of the season, and his upward trend is very encouraging. He didn’t always look pretty or efficient when it came to technique, but point blank he got the job done. His grade of “3” is exactly where I would want any starting OL. That is graded as a plus performance. Bobby Hart, on the other hand, mightily struggled. He allowed 3 sacks, 3 pressures, and committed 2 penalties. Two of his sacks were partially a result of Manning evading the pocket and running into the defender, however. Hart was getting beat from the start and put out the worst-graded NYG OL performance of the year. Interior: Justin Pugh continued to stay at the level he’s pretty much been at all year. Solid, slightly above average. He moved back to LG after his short tenure at RT and the fact he can maintain his level of play inside-out is going to add some money on to his contract come this offseason. D.J. Fluker replaced John Jerry early, getting a shot at facing off against his former team. He had a very up and down game. His ups, as we expected, came in the run game. A lot of movement up front and he sustained his blocks. As a pass blocker, he struggled. He allowed 3 pressures and the inability to pick up stunts is just alarming. How he can make this mistake over and over is just awful. Center Brett Jones was the surprise of the day, as he graded out at 2.95, second highest on the team. He is as gritty as it gets and reminds me a ton of former Giants’ OL Rich Seubert. Defensive Ends: With Oliver Vernon on the sideline nursing his ankle injury, Kerry Wynn got the start. He proved he just isn’t an every-down guy, as his impact was never felt. Jason Pierre-Paul continued his disappointing season, finishing with a mere 4 tackles and 1 QB pressure. Unlike previous weeks, the Chargers were dropping back deep, giving several opportunities for the ends to make their mark. It never happened, as Rivers wasn’t sacked once. Pierre-Paul has struggled mightily to disengage from blocks despite getting off the ball well. And the two offsides penalties for lining up in the neural zone are almost inexcusable. Rookie Avery Moss got on the field for 29 plays. His lack of power presence was apparent. Defensive Tackles: The Damon Harrison/Dalvin Tomlinson duo inside continues to be a strength. The Chargers really struggled to consistently gain yards on the ground between the tackles. Harrison played arguably his best game of the season, eating blockers and space with ease. He added 5 tackles, one of which was for a loss and broke up a pass. Harrison also showed some pass rush we haven’t really seen much of this year. Jay Bromley played about half the team’s snaps and was able to hit Rivers a couple times. B.J. Goodson was solid in run support, mainly inside. However, he was beat badly in coverage on multiple occasions, furthering the fear around the idea he may not be an every-down guy. Melvin Gordon beat him badly in to the flat for the Chargers first score in quarter 1. Keenan Robinson, a player that is supposed to be making his money via ability to cover backs and tight ends, was getting beat routinely in addition to shoddy run defense. With The Giants up by 2 with 3 minutes left, Robinson failed to stick with Gordon into the flat for his second easy touchdown catch of the day. Jonathan Casillas was banged up and tried to play through it, but his impact on the game was never felt. 2016 first round pick Eli Apple has officially lost ground on the depth chart, having sat on the sideline for the first three defensive series. Apple didn’t have a bad game once he got on the field, however. He played stout run defense on the outside, totaling 5 tackles. One glaring negative from Apple that may only bother me: can he please not openly laugh on the sidelines while the rest of the team is staring at the ground as their record is just minutes away from being 0-5? His little-kid approach was shown during training camp as well. Ross Cockrell got some more playing time as a result, but allowed two big third-down conversions and had 2 missed tackles. Dominique Rodgers-Cromartie and Janoris Jenkins both played well. Unfortunate this team is wasting such solid veteran CB play on such a bad year, because it’s a really tough position to fill. Darian Thompson has struggled this year, but his performance against LAC was very encouraging. He intercepted a pass in the end zone and had two high-level deflected passes. Thompson was also a factor as a blitzer and run defender, leading the team with 11 tackles. The second-leading tackler, Landon Collins, played through a lower-body injury sustained in the first half. His aggression is usually a weapon for this defense but it turned out to be a negative on a few occasions against the Chargers. He over-pursued play-action fakes and was beat in coverage for a touchdown and two separate third-down conversions. The injury may have slowed his reactions a tad, but Collins had his worst game of the year and it really hurt this defense at the most inopportune times. K Aldrick Rosas: 2/2 extra points. I found it interesting that McAdoo, for the second week in a row, would not attempt a 50+ yard FG attempt with the strong-legged Rosas. P Brad Wing: 8 punts – 44.1 avg. Wing pinned the Chargers inside their own 20 four times, and inside their own 10 twice. Very good bounce back performance for him after two consecutive weeks of game-altering punts, in a negative way. Return: Dwayne Harris had his best game of the season, returning 3 punts for 38 yards. He was making a difference in the field position game before his injured his foot, which ended his season. The Chargers may have shown up 0-4, but they are not a bottom feeder in the NFL. They were seconds away from a win in Denver, their kicker missed a chip shot field goal at the end of their week 2 game against Miami. This is not a bad team, in fact, this may be the best Chargers team we have seen in years. If there is a team you want to bet on that appears to be down and out, but can comeback in to playoff contention, Chargers should be that team. Hard to watch Russell Okung, who was available this past offseason, dominate at left tackle week after week. NYG had a shot at this guy and I was told Okung was interested in playing here. The issue with being stubborn about past draft picks that aren’t panning out is the missed opportunity to getting a guy like this. This guy should have been in an NYG uniform, not the LAC one. Not sure how many people pay attention to the CB Cameron Heyward, but he is one of the top 5-6 CBs in the league. He has really developed nicely after inaccurately being labeled a slot-only CB. On October 8th, the 2017 season has now become all about next year and beyond. They aren’t doing any damage this year, but the value of watching and paying attention now is trying to find players that you can move forward with. Can Brett Jones be a cheap starter at OC? Is Wayne Gallman a starting caliber RB? Are any of these WRs going to be in the rotation next year? Can Eli Apple progress? Eli Manning will not, and should not, be benched for Davis Webb. It is a ludicrous idea. He is still going to be the guy next year and Webb never showed anything that would lead you to believe he is the next guy. Remember, he is a 3rd round project that nobody wanted to see the field this year. Is Ereck Flowers turning it around? He has gotten better 3 weeks in a row, with this game being the best we’ve seen possibly over his whole career. I firmly he is not the left tackle you want long term, but if he can prove to play at a decent level from here on out, NYG may have their RT of the future. 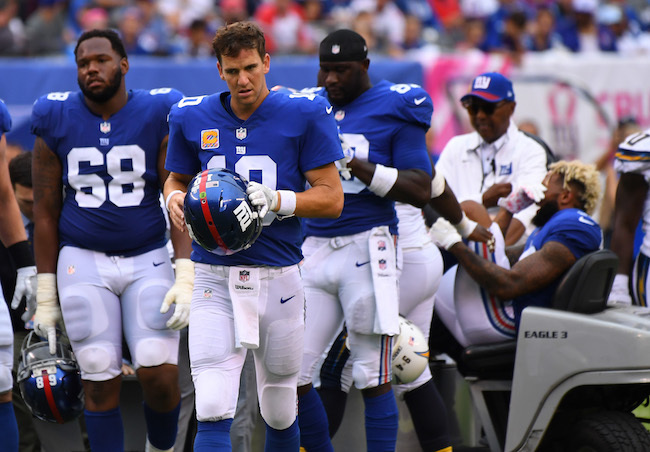 It just keeps getting worse and worse for the New York Giants, who lost their fifth consecutive game on Sunday, falling 27-22 to the Los Angeles Chargers at MetLife Stadium in East Rutherford, New Jersey. The Giants also lost four of their five active wide receivers to injury as Odell Beckham (fractured ankle), Sterling Shepard (ankle), Brandon Marshall (sprained ankle), and Dwayne Harris (fractured foot) left the game and did not return. The injuries to Beckham and Marshall looked very serious. The Giants are officially reporting that Beckham fractured his ankle. ESPN is reporting that Beckham may undergo surgery as early as today or tomorrow. The NFL Network is reporting that the team believes Beckham broke his fibula. He will need to undergo an MRI to ascertain any ligament damage. The game itself was sloppy and difficult to watch. The Giants squandered a 9-0 1st-quarter lead, and yet another 4th-quarter lead as the team was up 22-17 late in the contest. After the teams exchanged punts to start the game, New York went up 2-0 as a botched snap by the Chargers was knocked out of the end zone for a safety. After both teams punted again, the Giants went up 9-0 on Orleans Darkwa’s 23-yard touchdown run, capping a 5-play, 64-yard drive. The play marked the first time a Giants’ running back scored a rushing touchdown this year. But the Chargers overtook the Giants on the scoreboard before halftime with an 8-play, 77-yard touchdown drive and a 12-play, 49-yard field goal drive. Chargers quarterback Philip Rivers threw a 6-yard touchdown pass to running back Melvin Gordon and place kicker Nick Novak kicked a 20-yard field goal. The Giants twice squandered excellent field position in the 2nd quarter – starting one drive at their own 45 and another at the Chargers 39-yard line – coming up with no further points in the first half. The Giants went three-and-out to start the 3rd quarter. The Chargers drove to the Giants’ 14-yard line, but Rivers’ 3rd-and-7 pass was intercepted by safety Darian Thompson in the end zone. It was the first pass the Giants have picked off all season. The Giants then re-gained the lead on a 9-play, 80-yard effort, culminating with a perfect quarterback Eli Manning 29-yard touchdown strike to wide receiver Roger Lewis. Giants 16 – Chargers 10. But the defense could not hold the lead as the Chargers responded with a 12-play, 92-yard drive that ended with a 25-yard touchdown pass from Rivers to tight end Hunter Henry. It only took five plays (and 75 yards) for the Giants to move ahead again. Under duress, Manning found a wide-open Beckham for a 48-yard score. After a delay-of-game penalty, the Giants’ 2-point conversion attempt failed and New York led 22-17 with 13:31 to go in the game. After both teams exchanged punts, the Chargers got the ball back again with nine minutes to play. Los Angeles moved the ball 48 yards in 11 plays to set up a successful 31-yard field with just under five minutes to go. Then came disaster. On 2nd-and-7, Manning’s high slant pass to Beckham fell incomplete. It was on this play where Beckham got seriously injured. On the very next snap, Manning was sacked and fumbled the ball away at the New York 11-yard line. On 3rd-and-9, Rivers found Gordon again out of the backfield for a 10-yard score. The Chargers now led 27-22 with three minutes to play. However, by this point the Giants were down to only one wide receiver – Roger Lewis. The offensive line, which struggled all day in pass protection, allowing five sacks, imploded on the last possession with two penalties. Manning’s desperate 4th-and-10 pass from the Chargers’ 48-yard line was intercepted with less than 50 seconds to play. Game over. The erratic Manning finished the game 21-of-36 for 225 yards, two touchdowns, 1 interception, and 1 lost fumble. The only player with over 30 yards receiving was Beckham with 5 catches for 97 yards. Against Los Angeles’ 31st-ranked run defense, the Giants had their best rushing game of the season with Orleans Darkwa rushing for 69 yards on eight carries and Wayne Gallman rushing for 57 yards on 11 carries. Defensively, the Giants allowed 382 total net yards, including 124 yards rushing and 258 yards passing. The Giants have now allowed 100 yards rushing or more in five consecutive games to start the season. The Giants only forced one turnover and did not sack Rivers. Inactive for the game were running back Paul Perkins (ribs), center Weston Richburg (concussion), defensive end Olivier Vernon (ankle), quarterback Davis Webb, tight end Matt LaCosse, defensive tackle Robert Thomas, and cornerback Michael Hunter. 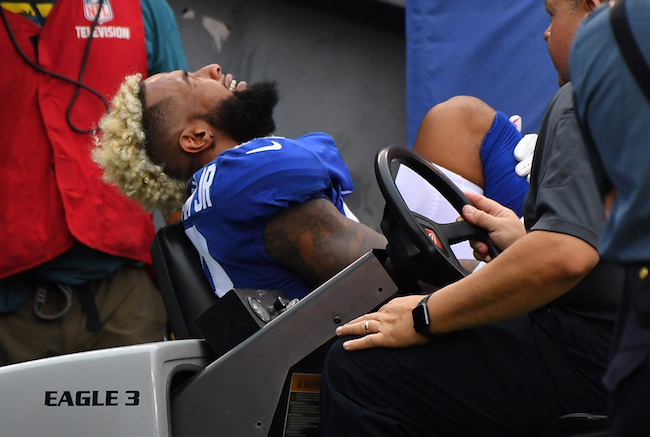 Wide receivers Odell Beckham (fractured ankle), Sterling Shepard (ankle), Brandon Marshall (sprained ankle), and Dwayne Harris (fractured foot) left the game with injuries and did not return. A number of Giants were in and out of the line-up with injuries including cornerback Dominique Rodgers-Cromartie, linebacker Jonathan Casillas (burner), safety Landon Collins, and running back Orleans Darkwa (lower body – calf?). Quarterback Eli Manning also had x-rays taken on his neck, but they were negative. The Giants fell to 0-5 for only the fourth time in franchise history. They lost their first nine games in 1976, their first five in 1987 (three of them strike-replacement games), and their first six in 2013. In those seasons, they finished, respectively, 3-11, 6-9, and 7-0. The Giants were also winless through their first five games in 1947 (when they started 0-7-2) and 1966 (0-4-1). The Chargers broke a nine-game losing streak dating back to last season. The Giants lost their fourth consecutive game to the Chargers, and now trail in the all-time series, 7-5. Quarterback Eli Manning’s ninth pass attempt was the 7,000th of his career. He is the seventh quarterback in history to throw at least 7,000 regular-season passes. It’s been decades since a New York Giants’ season was all but officially over this early. Even the 4-12 2003 New York Giants started the season 2-1. The strike-plagued 1987 team started 0-5, but there was also an expectation that the defending Super Bowl champions might make a push. You’d have to go back to the mess of the 1960s and 1970s to find such a depressing start. To be honest, I am at a bit of a loss in how to proceed with these game previews. The Giants are no longer really playing for the post-season but their own jobs. And that includes the coaches as well as the players. This team was supposed to be a Super Bowl contender. Instead, it is one of the worst teams in the NFL – on offense, defense, and special teams. Enter the win-less Los Angeles Chargers, another NFL team that abandoned its fan base in pursuit of even more $$$ to play in a city that doesn’t like football. So with one-quarter of the season already over, we are about to witness a glorious 0-4 versus 0-4 match-up of teams from America’s two largest media markets. This isn’t good for the NFL. For at least one more month, the owners, front office executives, coaches, and players will parrot talking points about the season not being over, but at some point, 2017 will become more about 2018 than the current disastrous season. Many fans will want the Giants to begin playing younger prospects in order to effectively ascertain what the team’s true needs are. But the coaches may be playing for their livelihoods. A game here or there could save Ben McAdoo and his staff. Will the coaches do what is best for the long-term development of the team, or for themselves? The 2017 New York Giants were clearly not ready to start the season. They slept-walked through their first two games on offense (13 total points), placing the team in a desperate 0-2 hole. Then continued offensive issues combined with late-game special teams and defensive breakdowns caused back-to-back devastating last-second losses. The offense may now be improving, but it is too late. And the offense is still not good. The Giants have NOT scored a point in the first quarter this year. They have only scored 17 first-half points in four games (an average of 4.25 points per first-half). So not only were the Giants not ready to start the season, they still aren’t ready at the start of games. Guess what? If you limit your scoring to only half the game, you are not going to win many football games. 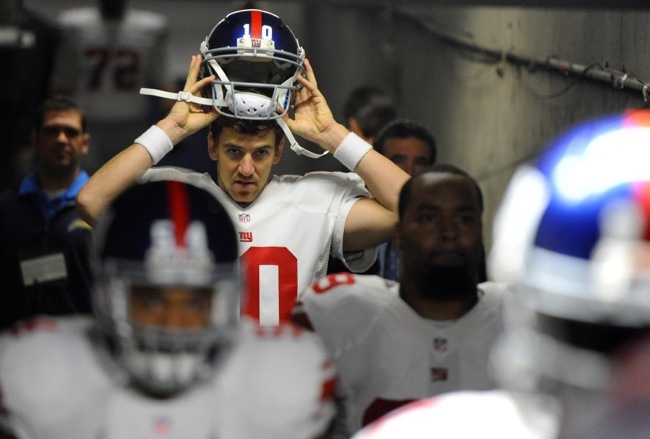 Quarterback: The New York Giants as a franchise squandered the last six years of Eli Manning’s career. Now 36, the #1 question this franchise faces is how long to stick with Manning. Is another year of the McAdoo-Manning combo really going to turn things around? Or do the Giants really want Manning to go through another dramatic coaching/offensive system change at the age of 37? It is hard to see the Giants pulling the cord on Manning, but they did it with Phil Simms so nothing is impossible. Wide Receivers: The fact that we are talking receivers next and not running backs is an indication of how the Giants and the NFL have changed. But the #2 question the New York Giants face is whether or not to re-sign Odell Beckham, Jr. to what undoubtedly will be the highest non-quarterback contract in NFL history. Take Beckham off of this team, and a dreadful offense would become unwatchable. He’s the only guy causing non-diehard fans to tune in. And other than his atrocious run-blocking effort, Beckham certainly isn’t dogging it. He’s a super competitor who wants to win. But the Giants should be at least a little concerned about giving a player who has been difficult to control/influence one of the biggest contracts in sports. Will he become more powerful than the coach and even more difficult to manage? Does this team want to tie up a huge portion of its salary cap to a wideout? My guess is that Beckham isn’t going anywhere, but the situation bears watching as the Giants continue to lose. Brandon Marshall isn’t the future of this team. The Giants should cut him, re-sign Taverres King or sign Travis Rudolph from the Practice Squad, and play the young receivers. Running Backs: Wayne Gallman should be made the starting running back. Paul Perkins needs to sit. Once Perkins (ribs) is healthy again, cut Orleans Darkwa (an injury-prone player who has no future with this team) and re-sign fullback Shane Smith from the Practice Squad. Gallman, Shane Vereen, and Perkins (last chance) should get remaining 2017 playing time. If someone gets hurt, Darkwa can be re-signed. Tight Ends: One of the few bright spots is Evan Engram. He looks like the real deal. The Giants appear to be in good shape here with Rhett Ellison and the under-utilized Jerell Adams. Offensive Line: It seems incredibly odd to me that the Giants did not prepare for a viable back-up plan if one (or both) of their young tackles struggled. Justin Pugh should have been moved to left tackle in camp. Ereck Flowers should have been moved to guard or tried at right tackle. What’s disturbing about Flowers is that a prospect who was supposed to be a mauler in the ground game now can’t seem to do anything well. He looks like a complete bust. Chad Wheeler needs another year or two in the weight room, but I’d be tempted to play him now and let him gain the experience. Re-signing John Jerry was a mistake. Well-respected OL Coach Mike Solari hasn’t delivered the goods in New York. No one appears to be getting better. And Jerry Reese and his scouting department can’t evaluate offensive linemen. This mess has been going on for years now. The narrative that Steve Spagnuolo simply needed better players is rapidly falling apart. The 2017 New York Giants defense is beginning to resemble the dreadful 2015 version. The Giants can’t stop the run, they can’t rush the passer, and they are beginning to give up late-game leads again. (The defense squandered TWO 4th-quarter leads in BOTH of the last two games). Defensive Line: The most shocking development has been the poor play of the defensive line. Coming out of the preseason, this group was healthy and looked poised for a monster year. The ends – who have played too much and are now struggling with injuries – have been a huge disappointment. Neither Jason Pierre-Paul nor Olivier Vernon are justifying their current contracts. The tackles have been a bit better. None of the back-ups – both outside and inside – have distinguished themselves. The Giants will need to spend a premium draft pick on a defensive end in 2018. Linebackers: Jonathan Casillas had a strong season in 2016, but that now looks like it will be his career year. He is not playing well. Keenan Robinson has regained his injury-prone reputation and also is not playing as well. Hopefully B.J. Goodson will be part of the solution moving forward. Devon Kennard is more of a situational player. Like the offensive line, Jerry Reese and staff seem incapable of drafting athletic, play-making outside linebackers. Depth at this position is putrid. Defensive Backs: The negatives here have been the continued inconsistent play of Eli Apple (1-3 bad plays per game offsetting otherwise solid performances) and the failure of Darian Thompson to turn into the player anticipated by the coaching staff. Moving forward, the Giants have to determine how much Dominique Rodgers-Cromartie has left in the tank beyond the 2017 season. And if Thompson doesn’t have “it”, the team still has a major hole to fill at free safety. Tom Quinn should have been fired years ago. It’s hard to be overly-sympathetic with the owners, front office execs, and coaches when something this obvious is not acted upon. The Giants have now lost three games in a row largely due to special teams breakdowns. Interesting that things started to go really south again once Larry Izzo left the Giants after 2015. Yada, yada, yada… No one is listening at this point. Those of us who are old enough have seen the warning signs before. When your star players start throwing the coaching staff under the bus, things can turn ugly fast. Odell Beckham’s comments about the Bucs knowing what plays the Giants were running is reminiscent of player criticism directed at Ray Handley, Dan Reeves, and Jim Fassel. Whether this criticism is valid or not is moot. Fingers are beginning to be pointed. Next warning signs? More and more players showing up on the injury report and not coming back quickly. The biggest draw for this particular game is that this is likely the last time Eli Manning and Philip Rivers will play against each other. Eli has never been on the winning side of this match-up (0-3).